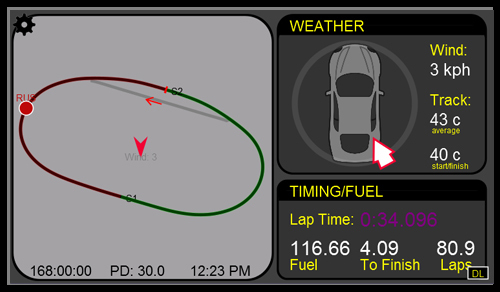 The Z1 Dashboard software includes the ability to display the position of all cars on the track in real time. Easily see which cars are in the pits; which are on track; which are ahead of you; which are behind you; and which are in your class. You can specify which colors are used to to draw all of these cars, making the track map fit your needs perfectly. 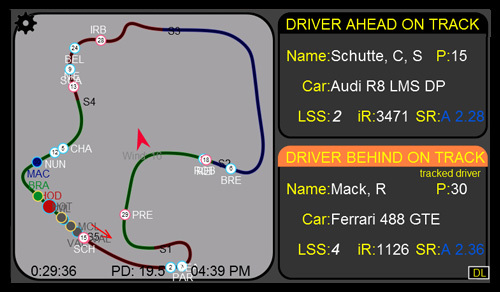 The track map uses a background image to display the main map, with overlays for the cars and sectors. This allows you to edit your the track map image for more customization. Want corner numbers or corner names, or notes? Simply mark up the background image for the appropriate track. Position of your car after a pit stop. Excellent for determining when to pit so you exit in clean air of ahead of a competitor! Sector positions can be optionally displayed on the map. Time different to cars ahead and behind you during a race. Time different to the fastest lap during practice. Car classes are distinguished with colored outlines around each circle. The pit lane can be included in the track map (for iRacing). 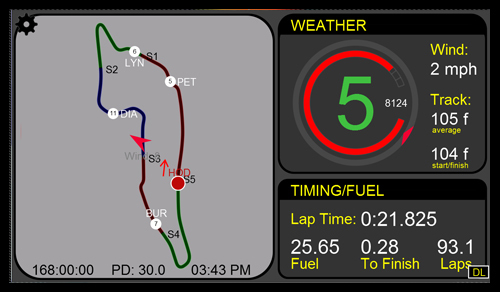 In addition to all these features, the track map display also includes the timing and fuel data you've come to expect from the Z1 Dashboard software. 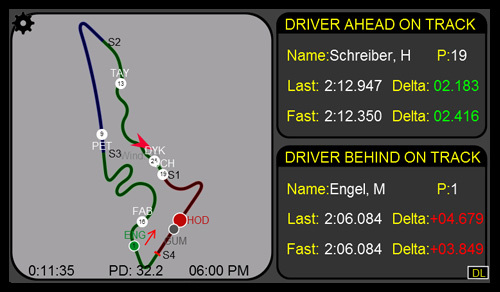 How Track Maps Are Created: The Z1 Dashboard software will automatically create the track map for you once you have driven one or two laps in a practice session. You can specify when the track map should be created in the settings dialog. 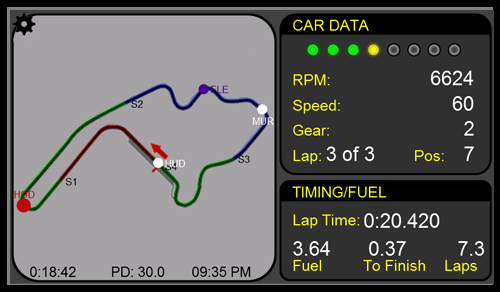 Note that for iRacing you will need to record a lap of telemetry and then open the lap in the Z1 Dashboard software's telemetry analysis screen in order to create the track map. In addition to rendering the track, you may also render the pit lane when using iRacing. To do so turn on the telemetry recording in iRacing (usually Alt-T) and drive a normal racing lap. Then drive another lap where you cross the start/finish line to both start and finish the lap in the pits. 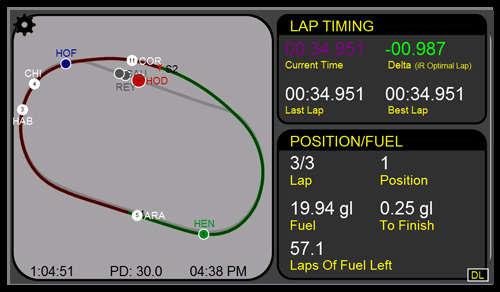 Next open the normal driving lap in the Z1 Dashboard's telemetry analysis screen. Click on the compass icon to create the track map. 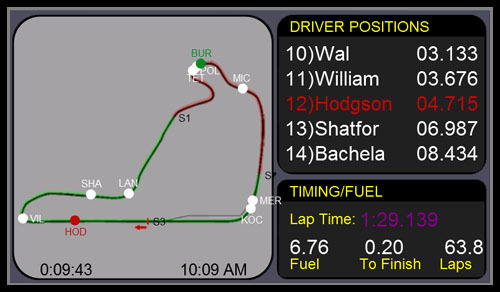 Then return to the selection screen and select the lap where you drove through the pit lane. Click	on the compass icon again to have the pit lane added to the track map. iRacing does not output the necessary data to create the track maps during a session. 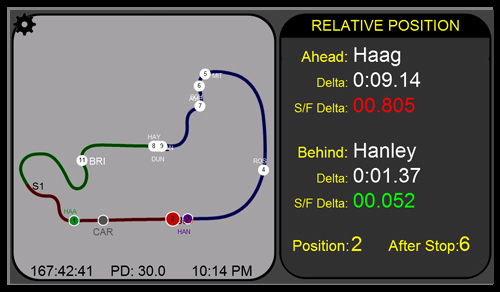 For this sim the Z1 Dashboard software comes with over 170 different track maps. 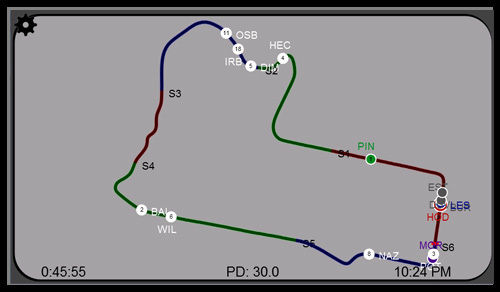 However, you may still create your own track maps from the iRacing telemetry files. This is the suggested method as it produces very accurate track maps. Drive a full lap with iRacing recording the telemetry. 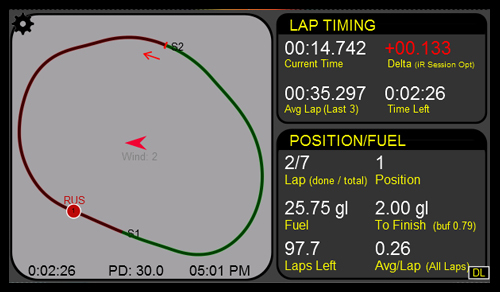 Then open that recorded lap in the Z1 Dashboard's telemetry analysis screen. There will be an option to create a new track map by clicking on the compass icon. For full details on the track map please see this page of the manual.